Point the third: I tried writing in a Starbucks today. That is, I sat in Starbucks waiting for my friend and had my outline notebook in my bag and proceeded to jot down about half a page. I've determined that I don't like writing in public. I feel paranoid that someone will read over my shoulder and other peoples' voices and music don't really help the concentration. And yes, I felt like a stereotype and pretentious, but at least it was a notebook and not a full laptop. Honestly, coffee shop writers---how do you do it? Point the fourth: My friend and I went to see A Gentleman's Guide to Love and Murder tonight. It's a Broadway musical that I can only describe as Downton Abbey meets Clue meets Monty Python. Basically: Monty D'Ysquith Navarro's mother dies and upon her death, a friend tells him that his late mother was a D'Ysquith, one of Edwardian England's most prominent families. Also, this friend tells Monty that only eight people stand in between him and Adalbert D'Ysquith, the Earl of Highhurst. So Monty, rejected by the family and deciding to seek revenge on them for the way they treated his mother, starts killing D'Ysquiths. It's not a gruesome musical though--it's actually, genuinely, hilarious. All of the D'Ysquiths marked for murder die in...interesting...ways. 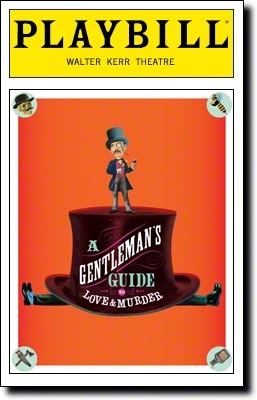 And they're all--men and women--played by Jefferson Mays, who was amazing as each and every one of his characters. I've been trying to work up the nerve to write in a coffee shop. Is definitely need a table in the corner. I forgot about the music. I think I could tune it out. We'll see what happens if I ever do it. That musical sounds really interesting. I haven't seen Monty Python but I know the gist of it. And I love Clue! You know, I thought it was DownTOWN Abbey. I finally set the dvr to record it yesterday when I finally just googled it to see what I had wrong because I couldn't find it. Boo. You can smack me. Lol! I was sitting at the counter by the window because there was nowhere else to sit in there. The longer I sat--and when the person sitting next to me left--I felt a little better about writing. I think I was able to drown out the music after a while. The musical was fun! You know, you can go to PBS' website and watch the Downton episodes you missed. I thought it was DownTOWN the first time I heard of it, too. IT IS SO COLD IN NEW YORK. Now that that's out of the way (seriously, I have a sweater, sweatshirt, and fingerless gloves on, the fireplace is going, and I'M STILL COLD), I also don't know how people write in public. I can't even really write while in the same room as my husband (who is still mourning the death of Pete Seeger). I don't really do well with any sort of noise going on at the same time. SO COLD! Both my friend and my phones were acting strange yesterday, because of the cold. Not enjoyable. Also, everyone's getting sick. I can't get in the groove to write in public. I was more comfortable playing CandyCrush in Starbucks than writing.